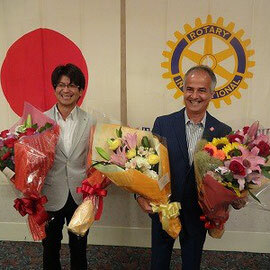 First of all, let me express my profound gratitude to all of you for giving me the wonderful privilege of serving as President of the Takamatsu Minami Rotary Club this past year. It has been an unbelievable experience for me, personally, and thanks to your support and cooperation I have enjoyed every minute. Let’s look back over what our Club has accomplished over the past year. We held a welcome party for these new friends in October and June where we strengthened our bonds of comradeship and unity. With regard to Fellowship activities, we held Rotary family parties in August and again at Christmas, each of which were attended by over 100 people. 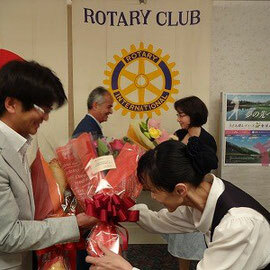 Family ties were strengthened and our Rotary culture was sensibly enriched. Special thanks are due to our new and younger members as well as to our Fellowship Committee for helping to make these events a success. We also organized a special meeting to celebrate the 80th anniversary of the establishment of the Setonaikai National Park. This event was attended by over 100 people, and was supported by our Kagawa University Rotoractors, and the Tanabe Hamayou RC. 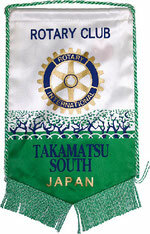 One of our goals for the year was to develop closer ties with sister clubs. 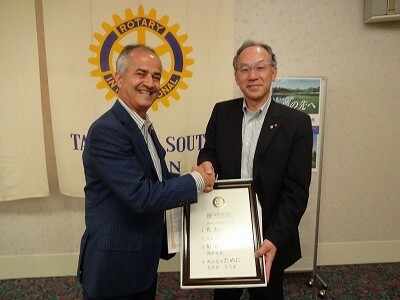 I am pleased to be able to report that we established sister club relations with Toyama South RC, and joined with them in celebrating the 50th anniversary of the founding of their Club. This year also marked the 5th year since establishment of sister club relations with Naha South RC. 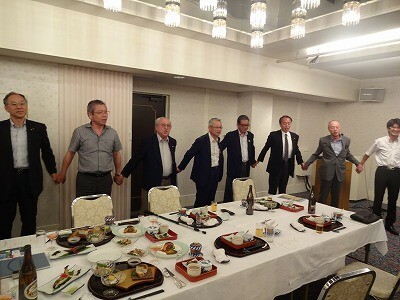 To help commemorate this anniversary a number of our members travelled to Okinawa, where we were treated to a welcome dinner party, attended their meeting, and presented a report of the activities our club during the past year. 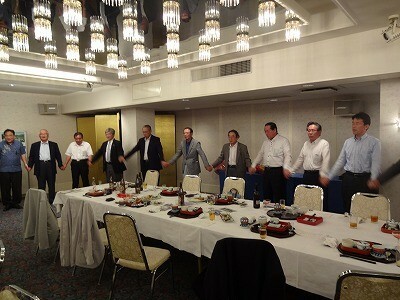 I am also very happy to report that we have established new sister club relations with Tanabe Hamayou RC, and I would like especially to recognize the important role played by PDG Ota in achieving this result. 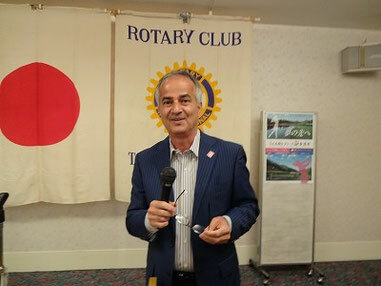 Another of our goals this year was to become a model club in Japan for our unity in diversity, sincere and heartfelt friendship, and our spirit of service. 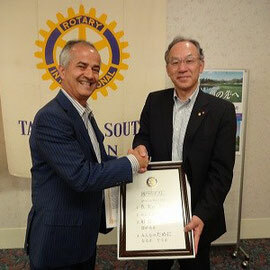 To help accomplish this goal we came up with the idea of sending out e-mail invitations to all of the Rotary Clubs in Japan, over 1800 in total, and as a result of this initiative many Rotarians from around the country visited Takamatsu and attended our meetings, including friends from Yokohama, Hakodate, Toyama, Tanabe, Anan, Naha, Funabashi, Tokyo, Chiba, Gifu, Nagoya, Kumamoto and Shodoshima. 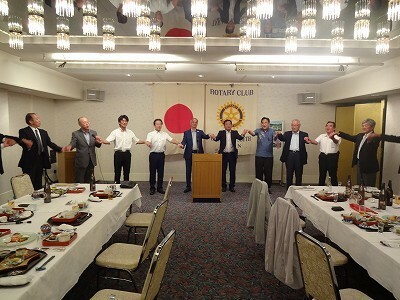 It was a great pleasure for us to welcome this diverse range of visitors and I’m sure that we all benefitted greatly from the chance to meet and establish or renew friendships with Rotarians from different areas, and especially from our neighboring Prefectures in Shikoku. 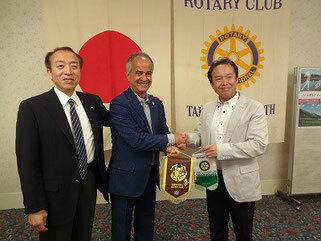 I am sure you will all agree that our decision to invite ambassadors from various countries to visit Takamatsu was perhaps the most distinguishing and unique feature of our Club activities this year. Our goal was to “Build new bridges in the world for the unity of mankind”, and of the 140 ambassadors we contacted, over 30 responded positively. In the end 6 ambassadors came to us, from Mali, Mozambique, Latvia, Algeria, India and Ireland. These visits were covered widely in the local press, and our initiative was highly praised by the Governor of Kagawa and Mayor of Takamatsu. I think the seeds planted by these visits will grow and blossom in future years and open up new avenues of friendship and cooperation. 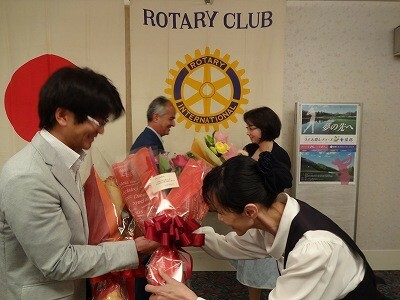 It was also our goal this year to energize the Kagawa University Rotaract Club. 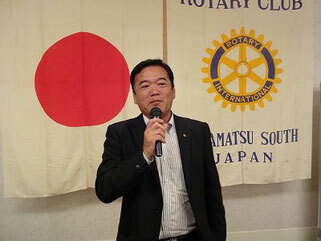 We were able to do this by helping to celebrate the 40th anniversary of the founding of the Kagawa University Rotaract Club in March, and we also hosted their District Convention in June, emphasizing the themes of Unity and Equality. 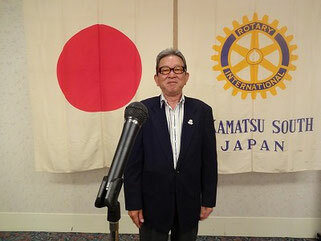 Other notable events during the year were our commemoration of the 30th anniversary of the passing of Yoshitaro Kamakura, where we welcomed as guest speaker Professor Eikichi Hateruma of Okinawa Prefectural Art University as guest speaker. 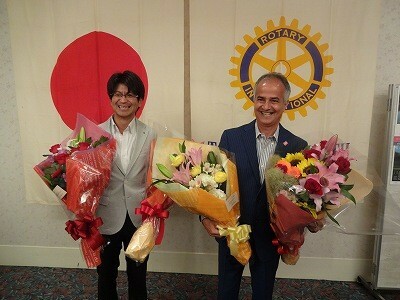 We also participated in the Ritsurin Garden project, and we celebrated our Club’s 57th anniversary at Ritsurin Garden. 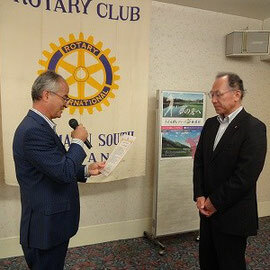 Moreover, as our Club’s 55th anniversary project, we produced a “Ritsurin Koen Carta”, which we were able to present to Ritsurin Garden. Looking back I’m sure you will agree that it has been an eventful and fruitful year. I am profoundly grateful for all the support you have given me. 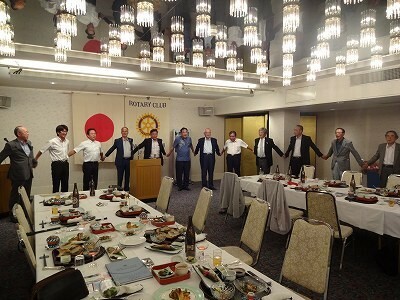 I believe that now, perhaps more than ever before, Japan and the entire world stand in need of the Rotary Spirit—sincere friendship, heartfelt cooperation, and a sense of unity that comes from the recognition that we all share a common heritage and live on the same earth. 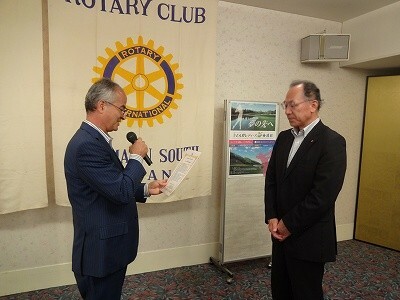 This is a unity that embraces all the diversity of the human race, and I think that we can all be proud that our Takamatsu Minami Rotary Club has played at least some small role in helping the world to become a better place for all humanity.